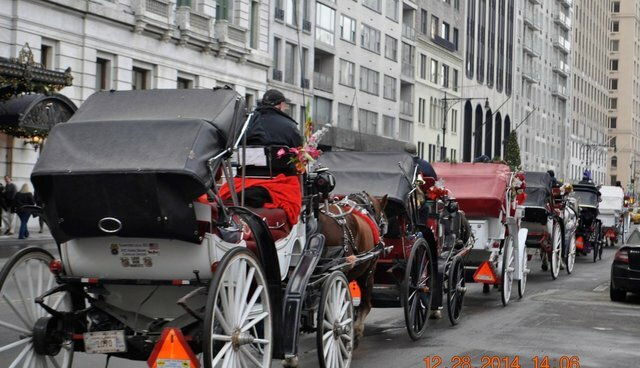 The Life and Death of an NYC Carriage Horse: Tickles (aka Barney) 1/1/97 to 2/13/15 Editor's Note: On April 1, 2015, the Coalition to Ban Horse-Drawn Carriages formally requested an investigation by the Department of Health into the death of Tickles. Click here to see the letter. Tickles, described as a sorrel colored draft horse, first became known to the public when the NY Daily News reported on Feb. 23 that he had been euthanized in his stall "after an accident left him with a fractured leg." According to the newspaper, it had happened a few weeks prior. Seemingly trying to get in front of and control the issue before it got out of hand, the News reported that the Department of Health vet consultant Dennis Farrell, the vet of record, called it a "freak accident." But activists were rightfully concerned. In New York City, we have an information vacuum where it is extremely difficult to learn about these horses that we hold so dear. 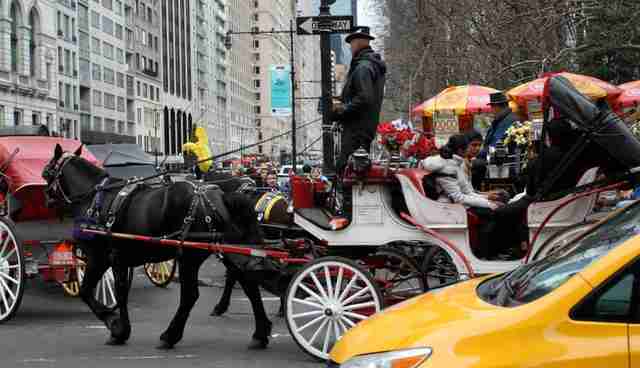 Most street laws are not enforced while the carriage drivers enjoy mostly laissez faire working conditions. The authorities look the other way. Try to report a carriage driver working his horse lame; or the numerous, illegal and dangerous U-turns on Central Park South or a driver refusing to return to the stable during a snow storm and you will be enmeshed in a Kafka-esque world. "The investigation needs to be independent, using a veterinarian who isn't paid by the horse carriage industry. We need to know the truth about how Tickles was treated and if he received the proper care before and after his injury." Using the Freedom of Information Law, I requested information from the Department of Health (DoH) about Tickles. The information received-although it was supposed to be "everything"-raised more questions than it provided answers. Tickles was estimated to be 18 years old with a nominal birth date of 1/1/97. It is nominal because horses like Tickles are not "important" enough to have papers with an exact birth date. It is only an estimate. 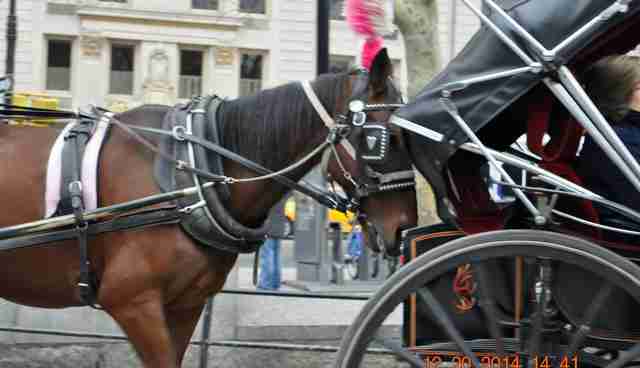 According to the available records, Tickles came into the New York City carriage trade when he was about 12 years old. This "beloved" horse was owned by Finbar Flood, who called him Barney - ID #3431 - and then sold him to Dina Tornabene on 2/21/11 for $600. The horse's name was changed to Tickles and his new engraved hoof number became #3680. Tickles worked out of Clinton Park Stables on West 52nd Street and, like the other horses, could legally work nine hours a day, seven days a week as a Central Park Entertainment Horse - sometimes very busy to the point of exhaustion and sometimes bored out of his mind. Tickles spent many hours in his stall, eating, resting and not much else. There was no pasture for him to graze in or socialize with other horses. He had returned from "furlough" just a few days before his death, but because of the way the law is written, it is not known what the horses do during this period. Were his shoes removed from both the front and back hooves? Was he able to graze on tasty grasses and perhaps socialize with another horse buddy. Or was he made to pull a carriage or otherwise work? An internal e-mail dated 2/24/15 at 12:39 pm from Sam Miller, Associate Commissioner at the Department of Health, and sent to the head DoH honchos, said that the "horse appeared to have become cast (stuck on the ground too close to the wall of the stall to get up) and had fractured his left front leg, which likely occurred during his struggle to get up." He provided this link to an article entitled "Help Your Cast Horse in Your Horse's Stall," which describes what this means and how to help your horse. But was this supposed to be the "investigation"? It is not uncommon for a horse to get cast in a stall regardless of its size. However, it should be noted that the New York City carriage horse stalls are small and need only be 60 square feet when just about every equine expert recommends at least 144 square feet for a standard bred and much larger-196 square feet -for a draft horse, which Tickles was. But there was simply not enough information provided. On Friday 2/13/15, Tickles, a sorrel draft horse #3680 owned by Bel Cavallo fractured his left fore leg. The horse was humanely euthanized after notifying the New York City Board of health and Dr. Pam Corey." On March 4, Farrell followed up on his own letterhead but said basically the same thing. Case closed? I hope not. This should not be acceptable. Did anyone at the Department of Health do a real investigation? Did they question the last person who worked Tickles on the street? What are the details for how Tickles was found? What kind of treatment was he given? Why should we believe that Tickles got cast in his stall-just because they say so? A horse who is cast would have been thrashing, kicking and making a racket in a desperate attempt to get up. Why didn't any of the stable employees or the manager hear this? We are told there is always someone at the stable. Were they not paying attention - or is this a made up story and Tickles' leg was fractured in another way? When was the last time Tickles worked on New York City's streets? He could have hurt his leg prior to that fateful day and it only became apparent on February 13. After all, Blondie, the horse who was worked lame for four days, had thrush and no one at the stable noticed it until a policeman saw driver Saverio Colarusso working him lame. Tickles had just come back from furlough on February 10. Did something happen there? Yes, lots of unanswered questions. The Department of Health owes it to the people of New York City to take a more responsible, accountable and hands on approach to these carriage horses who are at their mercy. They must stop working in a vacuum and be willing to publish information for the public to see. "I, along with thousands of New Yorkers who are concerned for the city's horses, eagerly await answers." All is not lost. You can help. 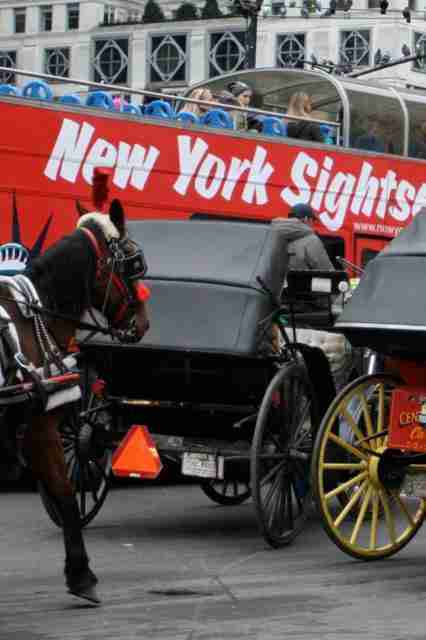 If you live in New York City, contact your council member: If you have not contacted your Council Member yet to support Intro 573, the bill to ban horse-drawn carriages in New York City, do so now. Call them. E-mails get deleted. Many are not aware of the constant disrespect for the law displayed by the carriage drivers who profess to "love their horses." Send them this article. You may find your council member by clicking here. If you live outside New York City, please contact members of the Transportation Committee. You may find the information in one of our recent newsletters. Follow us on Facebook at No Walk in the Park. And keep fighting the good fight.